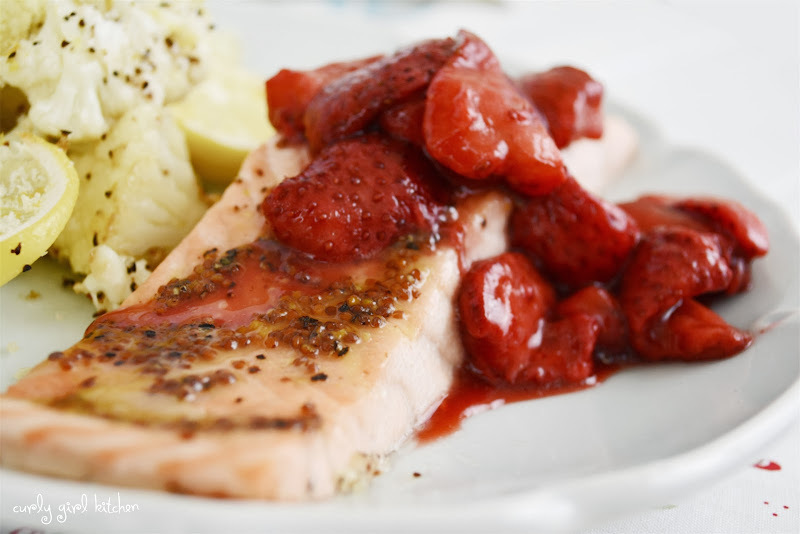 We make salmon for dinner just about every week, and I always look forward to those dinners, because salmon is one of my favorite things to eat. But since we eat it so frequently, we do tend to make it the same way over and over, since there are only so many ways you can cook a piece of salmon. 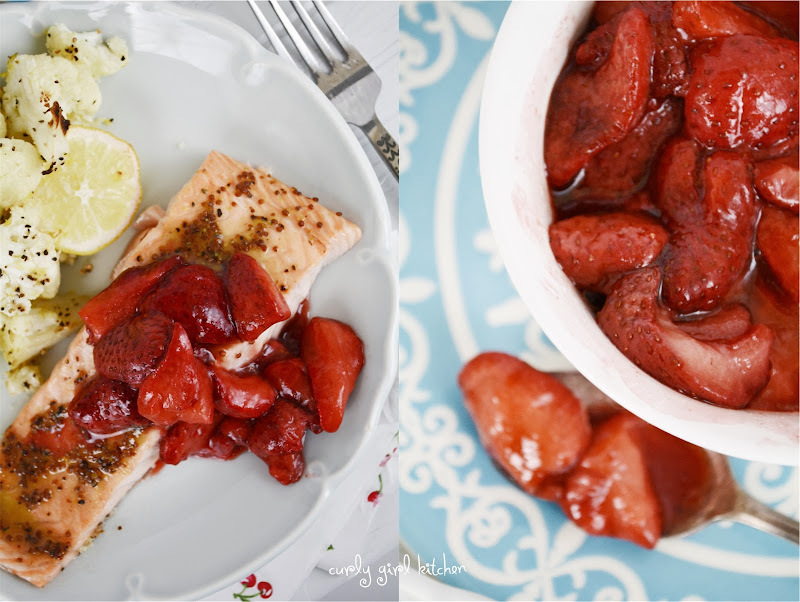 After making Jamie's strawberry pie last weekend, I had a few pounds of strawberries in the freezer, so I pulled those out thinking I could incorporate them into our salmon dinner somehow for something a little different. Since cooks top fish and salmon with mango and pineapple salsas all the time, I thought, why not strawberries? 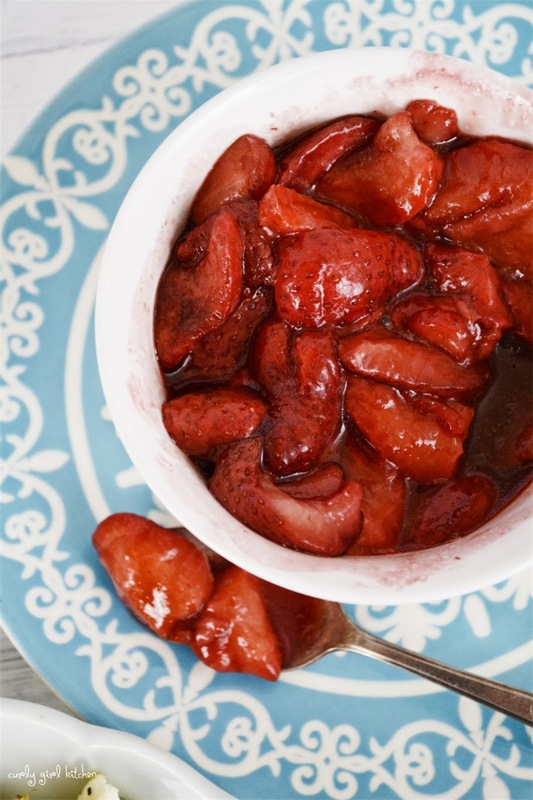 I drizzled the frozen strawberries with balsamic vinegar and roasted them until they turned warm and juicy. The scent of strawberries was intoxicating, and I could have happily eaten roasted strawberries for dinner. Just a bowl of berries and a spoon would be quite nice. For the salmon, I mixed a simple glaze of pure maple syrup and whole grain mustard with a pinch of salt and pepper, and brushed that over the salmon before roasting. 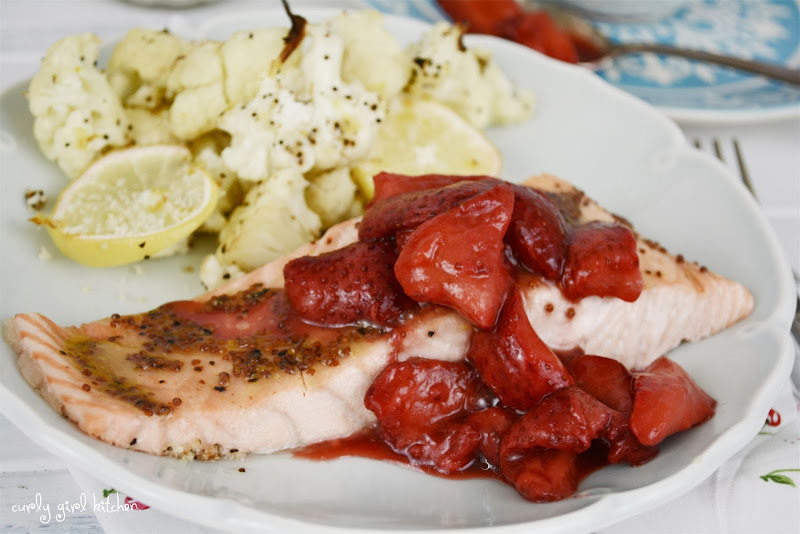 The sweetness of the maple syrup and the nutty texture of the whole grain mustard was delicious with the warm, slightly tart balsamic strawberries spooned over the top of the salmon. Preheat the oven to 425. 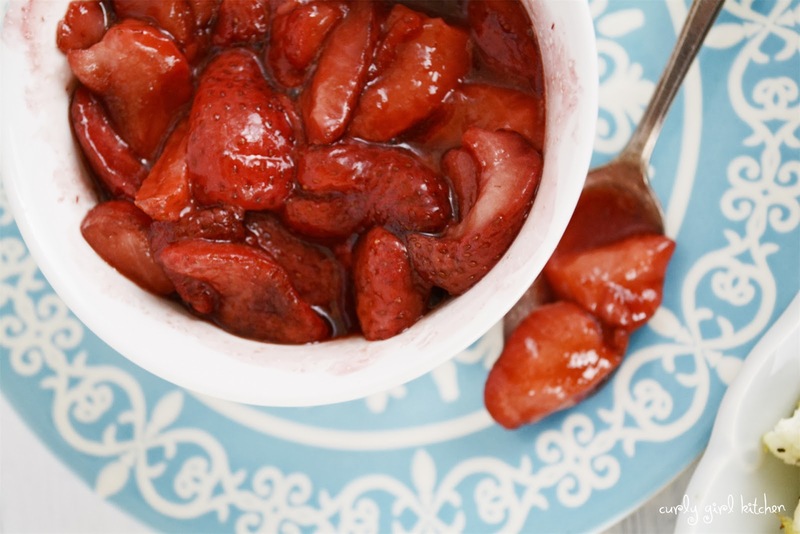 Arrange the strawberries on a baking sheet and drizzle with the balsamic vinegar. Place the salmon on a separate baking sheet. 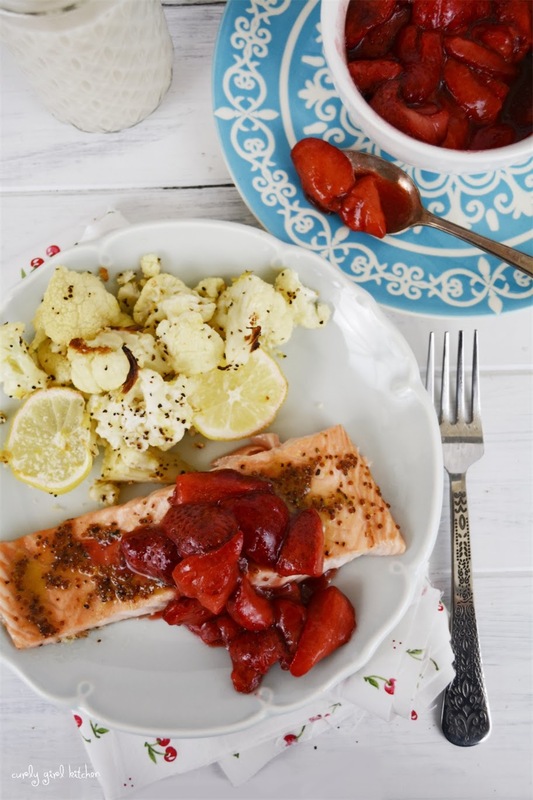 In a small bowl, combine the maple syrup, mustard, pepper and salt; brush over the salmon. 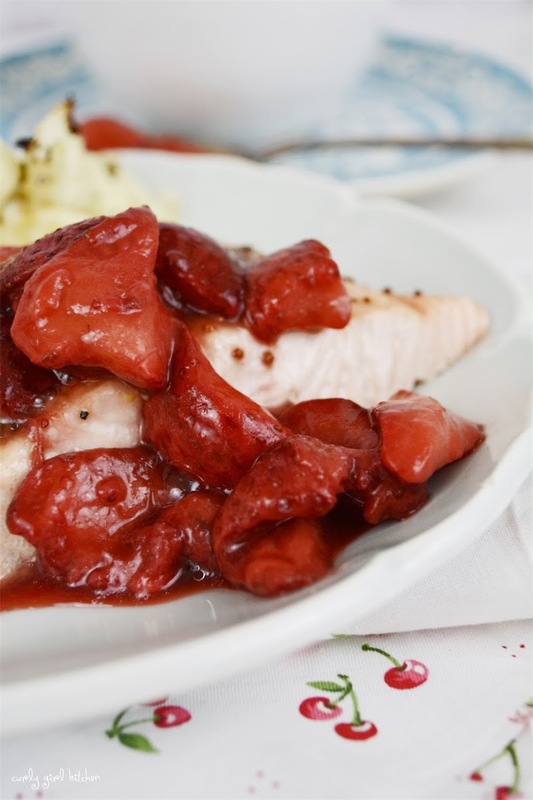 Spoon the berries over the salmon to serve.